Over the weekend I listened to this moving talk from the Burmese pro-democracy leader and Nobel Peace Laureate, Aung San Suu Kyi, where she examines what drives people to dissent. Reflecting on the history of her own party, the National League for Democracy, Aung San Suu Kyi, examines the meaning of opposition and dissident. She also explains her reasons for following the path of non-violence. If you’re interested in freedom and dissent then Aung San Suu Kyi’s talk at the 2011 Reith Lecture is worth spending 45 minutes on (there’s a few news items before the talk commences). A transcript of Aung San Suu Kyi’s talk is also available for download (PDF). It has been fascinating to watch the progress of the various revolutions in north Africa and the middle east, in particular the travails of the Libyan people trying to oust the long-standing dictator Gaddafi. Unlike the other countries in the region, the Libyan dictator has a strong army and he is not afraid to use the full might of his arms against his own people. In Libya we are seeing people rise up against a tyrant and face arms to achieve their freedom. They are weighing up the price and the value of their freedom in important ways. It has got me thinking about how one might value freedom and what price one might be willing to pay to achieve it. In Australia we are divorced from harsh realities like this. We live in a wealthy nation with high levels of education, low levels of unemployment and a working democracy. For many of us our main problem is what kind of plasma television to get next time. These are first world problems. Our politicians argue about relative trivialities. And now we have both sides of politics in Australia polarising and calling for so-called Peoples’ Revolution. I think that this kind of polarisation is one of stupidest ways to attempt to create a positive future for Australia. We need to create shared values and agreed common ground in the middle. We need to build consensus and have our politicians work together on that common ground in a bi-partisan way. This current political climate of negativity, anger, personal attacks, slurs and invective does help us to create a positive future for Australia. Nor does it model good behaviour for our young people. It’s time for the moderates to stand up and be counted. A recent disclosure that a Federal public servant has been blogging about matters political in his personal time has come to be referred amongst Australian journalists and bloggers alike as #groggate. There has been much discussion about the rights and wrongs of this unmasking of a pseudonymous blogger who had the temerity to question the efficacy of the retinue of journalists who were following the election candidates around the country. The debate about this continues to rage across the blogosphere and twittersphere; and in the publication that outed the blogger it seems they are using the issue as linkbait in fine blogger tradition. But, as some wiser folks have realised, this matter is not about one public servant and his blog. It is about participation by private citizens in public discourse. Up until recent times the opportunity for the average citizen to participate in public discourse was extremely limited. Instead participation by private citizens in public discourse was mediated by newspapers, magazines and television channels – the professional news media. Because of this historical role as gatekeepers of access to public discourse the professional news media in Australia appear to believe that they have a privileged position to maintain. I believe that this feeling was what drove the unveiling of the author of the Grog’s Gamut blog. It appears to have been a rearguard action by members of the professional news media who feel their gatekeeping role with respect to public discourse is being eroded. Funnily enough they are right. Their role as gatekeepers who set the agenda for public discourse is eroding under their very feet. Instead we are seeing a fragmentation of the media landscape. Eternal verities such as guaranteed audiences are splintering and nobody really knows what will happen next. And into this shifting media landscape new voices – those of private citizens – are flourishing in niches. Not every new voice is excellent or expert. Not every new voice is skilled in the ways of fact-checking and other journalistic niceties. But some of these new voices are finding loyal and interested audiences. Grog’s Gamut was one such new voice. But Grog’s blog was written under a pseudonym – it was not an anonymous blog as some have asserted. And the journalist and his publication could not resist the temptation to reveal the real name of the author. That revelation means nothing to most people. But to this particular public servant it means scrutiny from mandarins at senior levels in the public service and the possibility that he might lose his job over his private opinions shared in his private time as part of his contribution to public discourse. Further, it means that every other public servant will be watching what happens to the author of Grog’s Gamut. They will be watching to see if it is possible for a public servant to participate in public discourse in Australia. They will be watching to see if it is too dangerous for their jobs to put their heads above the parapet. They will be measuring the possibility of danger and assessing whether or not they should support Government 2.0 initiatives. Other private citizens – those who work for major corporations – will also be watching what happens to Greg Jericho. Many will assess the risks of their participation in public discourse. Some might be discouraged from participation. But I hope that others will choose to embrace the new media tools and give voice to their opinions. I hope that others will share their opinions, ideas and information. I hope that they will continue to create niches and fragmentation of the traditional media. We need new voices. We need to democratise participation in public discourse. Some of it will be ill-informed rubbish. But amongst the dross will be some gems and our society needs to find those gems. It has been very interesting (during the 2010 Australian federal election campaign) to watch people advocating freedom of speech on one hand and then getting upset when people with differing views speak out. The intolerance of opposing points of view has really resonated with me. It makes me a bit sad that we are not always able to have a free and frank discussion of important issues. However, it has also made me question how willing I am to listen to the other side of an argument. Interesting question, isn’t it? Both sides of politics here (Liberal/National and Labour) have abandoned all pretense of bipartisan approaches, leading to polarisation. There is not much listening going on at all, and hardly any visionary policy for Australia – just polemical positions that make me sigh. I suspect that will just drive voters to make the Senate not winnable by either major party, with the Greens and a handful of Independents as the only likely winners. The other thing that I have observed along with this is the growing trend towards ‘thought crimes’. No longer does one need to actually perform an illegal act to commit a crime. It is now sufficient in many regimes, such as Australia to simply think about something or to have contact with certain groups of people (see here for overview). Also we are seeing growth in surveillance – CCTV and the like – to protect us from violence and crime. It makes me wonder if all these things are not adding up to create a less tolerant mindset for our society than we have been used to for the past few decades? Freedom – price or cost? Many people have told me that freedom has a price. While others have told me that freedom has a cost. It got me thinking about the difference between a price and a cost. Perhaps value is only perceived in relative rather than in absolute terms? How do we know freedom is a good thing unless we know that repression exists? Freedom is precious. But the true value of freedom is only known in relation to un-freedom. Cost: An amount paid or required in payment for a purchase; a price. Or the expenditure of something, such as time or labor, necessary for the attainment of a goal. Thus it seems that both groups of people are right when they talk about freedom. It has an agreed exchange value (a.k.a. price), which is the expenditure of something (a.k.a. cost) to attain a goal. But since freedom is not tangible (sometimes it is easier to see freedom by its absence) and it can easily be whittled away without us noticing. Freedom is under attack all over the world. Rules, laws, things meant to protect us all chip away at freedom. Each little chip has a plausible reason, when taken in isolation. However, the sum total of the overall pattern is reduction in freedom. 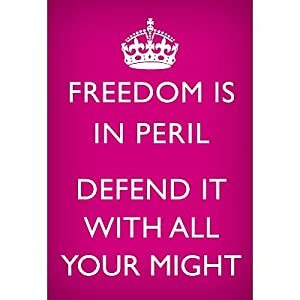 What have you done today to defend, protect or extend freedom? What is the price of freedom? And what cost are you willing to bear? We take our freedom of speech for granted! This news item from Techcrunch – hat tip to @jowyang for the link – makes me conscious of how precious are our freedoms of speech and association. People fought hard in the past to achieve those freedoms for us and we need to protect them. Some bloggers in other countries are risking their lives to do what we take for granted – post opinions and news on a blog.